Likes: Beautiful colors, great texture and pigmentation for Saucy, affordable! Gripes: Rain has a thicker texture so it takes longer to dry, not available locally. CI 77891 (Titanium Dioxide), CI 15850 (D&C Red No.6), CI 77499, CI 77491 (Iron Oxides), CI 77510 (Ferric Ferrocyanide), CI 77000(Aluminum Powder),CI 19140 (FD&C Yellow No.5), Calcium Aluminum , Borosilicate, Silica, Polyethylene terephthalate. 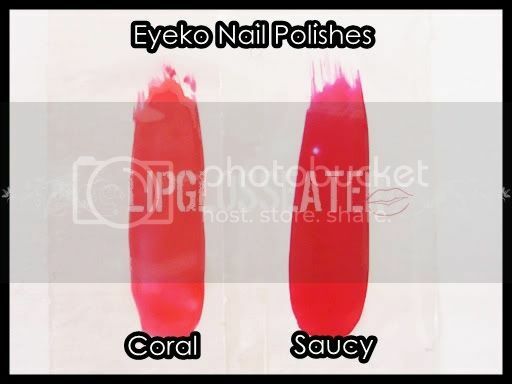 Nail the latest trends with Eyeko Polish in the most fashion forward shades. At just £3.50 for each 8.5ml bottle they’re the perfect finishing touch for fashionistas with a price tag that won’t nag your conscience. 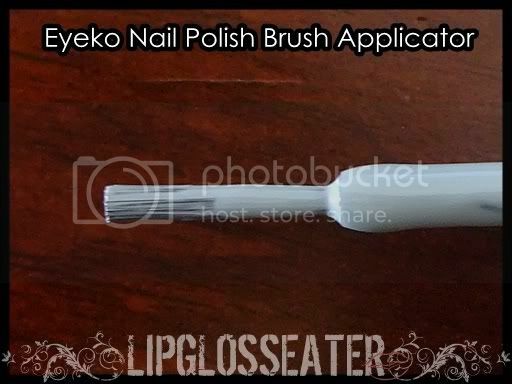 Eyeko Polish features a nail friendly formula that is Toluene, Formaldehyde, DBP and Camphor FREE! No Colour fade thanks to UV absorbers and an amazing glossy, chip resistant finish which strengthens nails too! Here comes the Rain...but there's always a silver lining and 2 coats of the grey-blue hue will put a smile on your face. It's a classic! One coat of this rich scarlet shade will turn your talons into hot stuff! Another great review! The bottle looks so adorable! Thanks for the link love Jen. I agree with everything you said. Saucy has a fantastic texture, one of the best I've ever come across in a nail polishes. It just applies so smoothly. It's a shame the tetxure of Rain is harder to work with but the color is so beautiful I don't mind too much.